10 n Performance & Hotrod Business n March 2015 VP Fuels Race Series VP Racing Fuels is racing into 2015 as a major sponsor/fuel supplier of several high- profile race series, including drag and sports car competitions. "As racers plan their programs for 2015, we encourage them to contact VP Racing Fuels to ensure they get the best fuel for their application where, when and in the quantity they need it," said Steve Burns, VP's founder and director-R&D VP was recently introduced as the official fuel of the NMRA, NMCA and NMCA WEST, and the required spec fuel for all heads-up classes except NMCA and NMCA WEST Pro Mod. The agreement between ProMedia Events and VP Racing Fuels began with 2015 season open- ers and continues through 2017, according to the company. VP Racing Fuels has also stepped up in 2015 as the NMRA Street Outlaw class sponsor, NMCA Pro Mod class sponsor and NMCA WEST title sponsor. 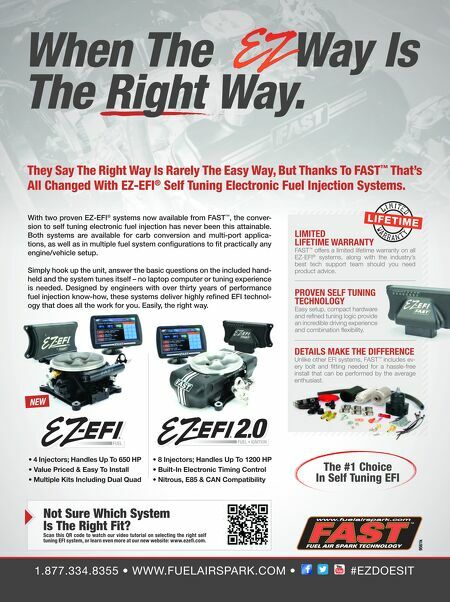 The company will also continue programs to support NHRA Sportsman racers in 2015. VP fuel trucks will be at many NHRA divi- sional events to provide fuel service in 2015, and continues to be the official fuel of tracks including Atco, Cecil County, Lebanon Valley, Epping, Bristol Dragway, Orlando Speed World Dragway, Gateway Motorsports Park, Royal Purple Raceway, The Strip at Las Vegas Motor Speedway and others. Finally, the International Motor Sports Association announced an extension of its partnership with VP as the official fuel sup- plier and partner of IMSA and the TUDOR United SportsCar Championship. VP is the official fuel supplier of the Continental Tire SportsCar Challenge and the Cooper Tires Prototype Lites powered by Mazda, and will continue to serve as the exclusive provider of racing fuels for the Porsche GT3 Cup Challenge USA by Yokohama and Lamborghini Super Trofeo North America as well. Contingency Connection Adds Speedways Contingency Connection has added Stateline Speedway and Eriez Speedway to its list of participating tracks for the 2015 racing season. "We are looking for as many ways as we can to put dollars back into the pockets of our loyal race teams," stated Bill Catania, Short Track Management CEO. "Aside from having one of the highest weekly purses in the coun- try at just north of $30,000 weekly, we will continue to seek these types of opportunities so that our on-track racing program will con- tinue to be the best it can be for our fans." Stateline and Eriez speedways have a com- bined 49 racing events on tap for 2015 with openers kicking off on April 25 at Stateline and May 3 at Eriez, according to an announcement. Highlights of the season include the World of Outlaws Late Models, Renegades of Dirt Modifieds, Patriot Sprint Cars, Empire Super Sprints and ULMS Late Model events. The Contingency Connection coordinates one of the biggest motorsports event-market- ing programs in the country with nearly 100 tracks and traveling series, 100 performance manufacturers and sponsors, and over 5 million attendees, the company noted. Additionally, its AERA-sponsored Engine Professional Rewards program includes 2,500 engine builders and machine shops in the U.S. and Canada. Toyo Proxes R1R Eligible for More Racing Classes The Toyo Proxes R1R tire from Toyo Tire U.S.A. Corp. is now eligible for more racing classes. The extreme performance tire has been reclassified to have a UTQG (Uniform Tire Quality Grade) treadwear of 200 AA A, according to the company, and was available beginning in January. The Proxes R1R has proven popular with the Street Touring classes of SCCA, both in the Solo National Championships and SCCA ProSolo. It is designed with a high-grip compound and an autocross-inspired casing design that makes it ideal for the street, slalom courses or on the track, according to Toyo. 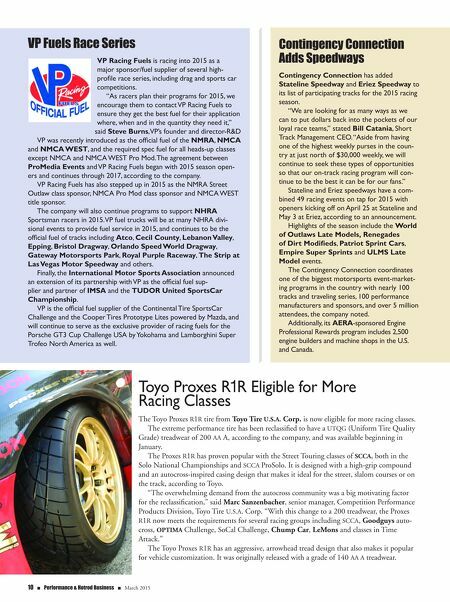 "The overwhelming demand from the autocross community was a big motivating factor for the reclassification," said Marc Sanzenbacher, senior manager, Competition Performance Products Division, Toyo Tire U.S.A. Corp. "With this change to a 200 treadwear, the Proxes R1R now meets the requirements for several racing groups including SCCA, Goodguys auto- cross, OPTIMA Challenge, SoCal Challenge, Chump Car, LeMons and classes in Time Attack." The Toyo Proxes R1R has an aggressive, arrowhead tread design that also makes it popular for vehicle customization. It was originally released with a grade of 140 AA A treadwear.